What if my boxes are not labeled properly and Amazon rejects the shipment? What if my product does not sell? What if my first reviews are negative? What if someone hijacks my listing? But, the mindset shifts after the first organic sales start to trickle in. I remember the relief and elation I felt when I got my first automated shipment notification from Amazon saying that my product was shipped to San Antonio, TX. That was the moment that I finally believed I could be successful selling on Amazon. It was a great milestone, but the journey to becoming a profitable Amazon seller had just begun. We in the Amazon circles need to talk more about what it takes, and what it means to be a profitable Amazon seller. Over the past nine months, I have been working with the Jungle Scout team to build Fetcher, a profit analytics tool for Amazon sellers. I have had the chance to talk with hundreds of Amazon sellers about their biggest challenges. 80% of the Amazon sellers I talk to are really struggling with bookkeeping and accounting practices. Most Amazon sellers do not really know their profits! Shocked? Not me. I was in the same boat. I struggled to evaluate my own profitability as an Amazon seller during my first six months in the game. There are a lot of misunderstood costs associated with selling on Amazon. Fit Small Business is a great resource for new sellers and in this article, they show you exactly how much it costs to start selling on Amazon in 2017. Eventually, I learned that if I did not change my practices and priorities to account for these costs (Amazon fees etc), my business would fail. “It is a capital mistake to theorize before one has data.” Sir Arthur Conan Doyle. Amazon data does not lie. It is just a matter of finding the right data and asking the right questions during analysis. In this post, we will put our Sherlock Holmes caps on, and I will take you inside one of my personal Seller Central accounts to demonstrate some best practices for locating the hard-to-find data and cracking the great mystery of profitability. We will study all of the pertinent data from Amazon’s most recent reporting period that lasted from September 15th – September 29th. All of the data we are going to analyze comes from one of my actual lighting products that I sell using FBA. I gave Sales a hard time earlier, but it is true that Sales are the lifeblood of any retail business. Seller Central tracks and displays sales in various formats. The challenge is weeding through the mess of data to find the relevant stories. For sales analysis, I recommend starting with a high-level view and going progressively deeper into the details. 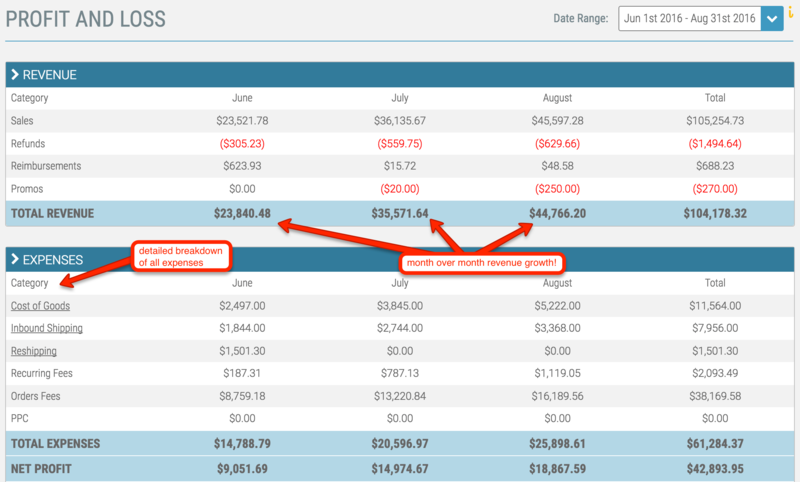 Start with the Amazon Sales Dashboard to get a quick snapshot of your sales performance. The most noticeable piece of information is Ordered Product Sales. This lighting product generated about $2,900 in revenue over the reporting period. Great, but what does that really mean for me? Not much. Next, take a look at the sales trend line. My first observation here is that this product appears to sell best in the early part of the week. I was curious enough to test this observation over a wider date range, and I confirmed that sales and conversions for this product are almost 15% higher between Monday and Wednesday than during the weekend period. Now that is actual data we can work with! A quick analysis of the data suggests that shoppers are more inclined to search for, and purchase this product during the beginning of the work week. This is a simple example of analyzed data that can drive effective tactical business decisions. After a quick look at the Sales Dashboard, I like to move onto the payments report to get a better idea of how my Amazon expenses are affecting revenue, and ultimately, my profits. Here is my most recent payment statement for the lighting product. I always run a quick cross-check on Amazon fees to ensure everything is in line with my expectations. For this product, I set a performance target to keep Amazon fees under 40% of total revenue. Amazon Fees = 34% of Revenue. Check! Think of this target as a waterline to observe. As long as Amazon fees stay under 40% of total revenue, the alarm will not go off, and no action is required. But if the waterline is exceeded, an investigation ensues and a business decision is required. Let’s pretend that Amazon fees had been 42% of total revenue, and the alarm had sounded. In this case, I would either adjust my target or take the necessary action to get back on track. Raising prices or lowering PPC spending could be quick solutions. But those actions can have a butterfly effect. Why not try to lower Amazon fees? Yes, it is possible to control Amazon fees. Manipulating FBA fees to your advantage is a baller move. It will require an advanced understanding of how FBA fees work and how they relate to your inventory turns. This guide to FBA fees can help get you to baller status. Use the refunds section to quickly calculate return rates. The waterline technique is critically important in managing refunds. Why? Most Amazon seller can not afford to spend their time investigating every single refund. Our time is better spent growing our businesses. Refunds are a massive part of the game because Amazon is built on a foundation of almost limitless customer service. In my opinion, Amazon is a customer-driven platform. Not a seller-driven platform. Think about it, Amazon will allow a customer to purchase my lighting product and nine very similar products in one transaction. The customer can install all ten products and evaluate them for three weeks before selecting one product to keep and returning the other nine. For this lighting product, I set a quality target of 6%. Meaning, the refund rate in dollars should be 6% or less of total revenue. Refunds = 5% of Revenue. Check! Some Amazon sellers prefer to calculate their refund rate in terms of total units refunded versus units sold. That view is easily available by going to Reports >> Business Reports >> Sales and Traffic and then filtering the pivot table with the right-hand column. Personally, I care more about the financial impact from refunds, which is why I calculate refunded dollars against total revenue. Also, Amazon credits some refund fees back to the seller, which would not be captured doing a units-based refund calculation like the one above in the Sales and Traffic pivot. Lastly, confirm the Closing Balance is exactly what is in your bank statement. Everything appears to be in good shape with this product. All high-level targets were met. This is the bi-weekly financial analysis I do every time Amazon closes a reporting period and issues a payment statement. The next level of analysis goes much deeper. To get there, we will need to adventure into the raw data reports. There are three primary data reports that I use. Downloading this file will give us a complete record of every single orders transaction that occurred during the reporting period. Call me overly cautious, but I use this report to quickly confirm that the data in the summary is correct. I like to make sure I am getting paid correctly 🙂 It is also a great place to catch odd transactions that would otherwise go unnoticed. The raw file looks like this. Yuck. Tidy up the data with a few pivot tables and you get a nice breakdown of fees and revenue. It offers a cleaner look at every transaction over the selected date range…including promotions! The raw file is pretty hard to work with. Clean it up into a pivot table and you get a solid breakdown. This can be a lot of work, but at least we have learned exactly where the money is going and how much Amazon owes me for the reporting period. Are we done with Amazon expenses yet? Nope! Did not see any advertising charges in there? This report covers a bigger date range than we have been studying (one of the challenges with Seller Central), but you get the point. The report is available and it accurately reflects my advertising spend and sales for this lighting product. There is plenty more data in the report that ought to be analyzed regularly. Pay Per Click lovers will want to check this out. OKAY! We have torn through all of the necessary Seller Central reports to calculate Amazon revenue and Amazon-specific expenses. We have Amazon Fees, Refunds, Promo Rebates,and PPC spend. But there is still a lot missing from these reports. Amazon does not factor in the costs to manufacture and ship each unit (Cost of Goods Sold). Additionally, they do not know the other overhead costs required to run my business. To accurately calculate profitability, I will need to parse together all of the data reports we collected, mix in my Cost of Goods Sold, and add any other overhead costs. This is the hard part. To make things a little easier, I built a fairly sophisticated Profit Calculator. If you would like a copy, please plug in your email address and I will send it right over. I added my Cost of Goods Sold and other business expenses into the Profit Calculator and let it do the rest. Wow, that was a lot of work! But it feels good to know how profitable this lighting product was over the past two weeks. The sucky thing is that in two more weeks I will need to download all of the reports again and run fresh calculations. And what if I wanted to track profitability on a daily basis? What if I wanted to compare this product with my other Amazon products? What if I wanted to compare reporting periods to see my performance over time? That is exactly why we built Fetcher! Fetcher’s personalized dashboard page offers an instant snapshot of total business sales, expenses, and profit. The Profit and Loss page provides a clear picture of the overall health of your business and allows you to see performance over time. Our beta users are loving Fetcher! Good luck on the road to profitability! Leave me your questions in the comments section and I will get back to you. Another inspiring article, Shane! I have never felt so confident about the margins of my Amazon business since teaming up with Fetcher Beta. Thank you for saving us all this manual work! Thanks, Carlos! I’m really glad Fetcher is helping! Great article shane and in much need of this information. Thank you for providing this knowledge that I was lacking. Please continue educating us with this articles about FBA reports and please make fetcher available in the UK. Thank you for great content! I learned a lot. Please make fetcher available for Germany. Thanks, Barbara. I’ll notify you when Fetcher is available in Germany! Can Fetcher be used in the UK and take account of VAT? Fetcher can now be used in the UK! Right now, Fetcher doesn’t automatically calculate VAT, but we will be adding it in the future! In the meantime, you do have the ability to track VAT in Fetcher by adding the costs manually in the section called ‘Other Expenses’. Is fetcher available for the India market ? need it for india, please!! Need it in India . Any timeline? Great, article. However, what about the shipping fees to send inventory into FBA? Is this listed in any of the reports you discussed? I cant seem to find it and no one online seems to mention this. We need it in India. Please share the update ASAP. We need this for India. Please let us know by when will it be available for Indian customers? I am looking to try something like fetcher out – i am based in the UK. Please can you confrim whether this is available in the UK yet? Fetcher is available to use right now in the UK! It’s super quick to sync with your Seller Central account – let us know if you need any assistance. I am an Amazon FBA user and this is very relevant to me. I used an FBA calculator to make things easier. However, I enjoyed reading your blog and it is really great to know how it is done.